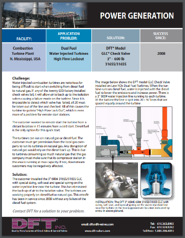 At DFT Inc. we understand that no valve is completely "one-size-fits-all" which is why we work with our customers to ensure we supply the right check valves for their unique system configuration. We have compiled a list of success stories based on different applications, from different industries, that have faced challenges that we were able to solve. Problems that we helped solve include: excessive cycling of a cooler system in the power generation industry and water hammer issues in the mining industry. Our Application Success Stories showcase that we are well-equipped to help your plant overcome its unique challenges. Learn more about becoming the next success story by contacting DFT today.